A bowl of pho simply sooths the soul. The salty bone broth is nourishing without greasiness, the silky noodles filling without overpowering the soup and the other ingredients a good addition but never the stars. Angus Pho House is quickly becoming my favourite place in the city. The dining room is small but brightly coloured artwork adorns the walls. I continuously get the beef brisket and beef tendon noodle soup ($7.95 for a small and $8.95 for the large): the brisket can be hit or miss (at times a few too many chewy bits) but the tendon always soft and sticky. 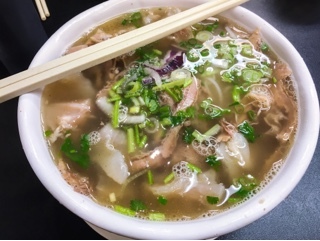 Aside from their great flavourful broth that’s not oily, the noodles are quickly cooked so they retain a delicate bite. The toppings – green onion, red onion, bean sprouts and Thai basil – are the traditional favourites and plentiful. Sometimes, we also succumb to the Vietnamese spring rolls ($5.95), even though they’re not required given the sheer amount of noodles in the small bowl. 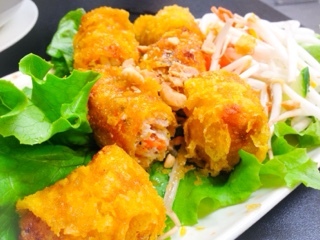 The fillings also vary in quality, at times the taro overtaking the bits of minced pork inside. However, they have always arrived freshly fried with a crisp crust. 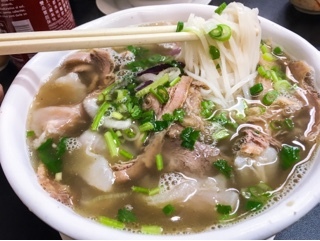 Angus Pho House’s menu offers a variety of options above the typical grilled meat on rice. Judging by other diners, their curry with roti, fried noodles and laksa noodles are also popular. Perhaps, maybe, who knows… I will try these other offerings. For now, I am satisfied with a hot steaming bowl of pho.